United Airlines today announced the next step in its commitment to making more customers more comfortable by adding more than 1,600 United Polaris® business class and United First seats to nearly 250 international and domestic aircraft. Additionally, United will revolutionize the regional flying experience by introducing the two-cabin, 50-seat Bombardier CRJ 550 aircraft to its fleet, offering customers on key regional routes more legroom, storage and amenities than any other 50-seat regional aircraft operating today. "In an era where many airlines are adding seats to their aircraft to crowd more passengers onto the plane, we're re-configuring more than 100 of our aircraft and doing exactly the opposite – for the benefit of our customers," said Andrew Nocella, United's executive vice president and chief commercial officer. "From adding more premium seats on aircraft that serve some of our most traveled routes, introducing a revolutionary, best-in-class 50-seat experience or simply offering free DIRECTV on more than 200 aircraft, we are committed to making United the airline that our customers choose to fly." In the next several weeks, United will introduce to its fleet the first of 21 reconfigured Boeing 767-300ER aircraft featuring 16 additional United Polaris business seats in the premium cabin – a more than 50 percent increase in all-aisle-access seating – bringing the total premium cabin seat count to 46. The newly reconfigured aircraft will also feature 22 United® Premium Plus seats (becoming the first 767-300ER to offer this seat type); 47 Economy Plus® seats and 52 Economy seats. 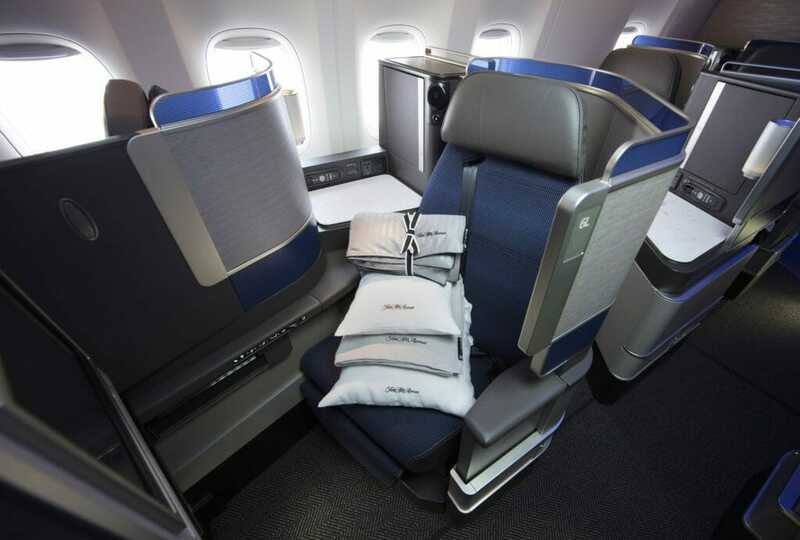 United will first operate the reconfigured 767 – which will feature the highest proportion of premium seats on any widebody operated by any U.S. carrier – between Newark/New York and London, offering 50 percent more premium seats in the largest premium route in the world. The airline expects to introduce all the reconfigured aircraft to its fleet by the end of next year. United is also adding more United First® seats to its fleet of Airbus aircraft, offering customers greater opportunities to upgrade and enjoy a premium flying experience. Beginning this fall, the carrier will add four United First seats on its fleet of Airbus A319s, increasing the total count from eight to 12. The reconfigured aircraft will also feature 36 Economy Plus and 78 Economy seats. Beginning early next year, United will add four United First seats on its fleet of nearly 100 Airbus A320 aircraft, increasing the total count from 12 to 16. The reconfigured aircraft will also feature 39 Economy Plus seats and 95 Economy seats. United expects to complete the reconfiguration of the Airbus A320 and A319s by the middle of next year. By the end of this year, United will revolutionize the regional flying experience with the planned introduction of 50 spacious, 50-seat Bombardier CRJ 550 aircraft to its regional fleet, subject to government certification. In addition to becoming the only 50-seat aircraft in the world to offer true first-class seating, the innovative new aircraft will provide customers with a truly exceptional flying experience, including a state-of-the-art interior featuring LED lighting, a self-serve beverage and snack station for customers seated in the premium cabin, Wi-Fi and more overall legroom per seat than any other 50-seat aircraft flown by any U.S. carrier. Additionally, the CRJ 550 will feature four storage closets, providing customers ample room to store their carryon bags and making the CRJ 550 the only regional jet in the skies where customers will not need to routinely gate check their bags. The two-cabin CRJ 550 will feature 10 United First seats; 20 Economy Plus seats and 20 Economy seats. The CRJ 550 aircraft will eventually replace existing single-cabin 50-seat aircraft and will bring a higher percentage of two-cabin departures to smaller cities across the carrier's network. Additionally, the innovative aircraft will enable United to offer premium seats on more connecting flights from smaller cities to the airline's overall global network, further strengthening its competitive position and emphasizing its role as an industry innovator. United expects that its regional partner GoJet will begin operating the CRJ 550 in the second half of this year – subject to agreement on final terms and conditions – on select routes from Chicago, O'Hare followed by Newark/New York, offering customers connecting through the hub the opportunity to enjoy a premium cabin experience at every step of their journey.